Posted: Thursday, June 7, 2018. 4:35 pm CST. By BBN Staff: The Belize Bureau of Standards (BBS) has just issued new fuel prices effective midnight tonight. The price of Diesel and Kerosene are being hiked. 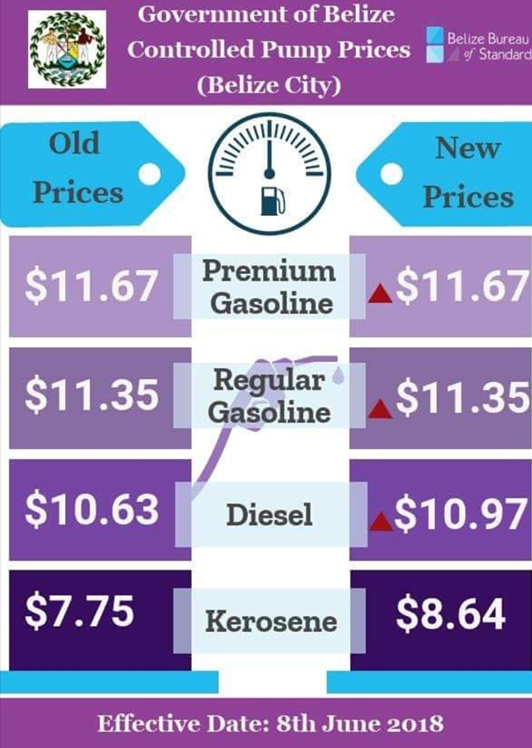 Diesel is being hiked by 34 cents – going from $10.63 to 10.97 while Kerosene will see an 89 cents increase – going from $7.75 to $8.64. Last month, in a press conference, Prime Minister Dean Barrow informed that because of the acquisition costs, the price of fuel would see more increases: “ I want to make clear that as all the world, we are going to be in for a difficult time in terms of fuel prices because of the acquisition costs, the global costs of oil is increasing at a rate that small countries such as ours is alarming,” Barrow stated. On April 4, butane prices were hiked by a whopping $10 more per 100 pounds cylinder.